The holidays are looming and you need something iconic to serve or give away to your friends and family. 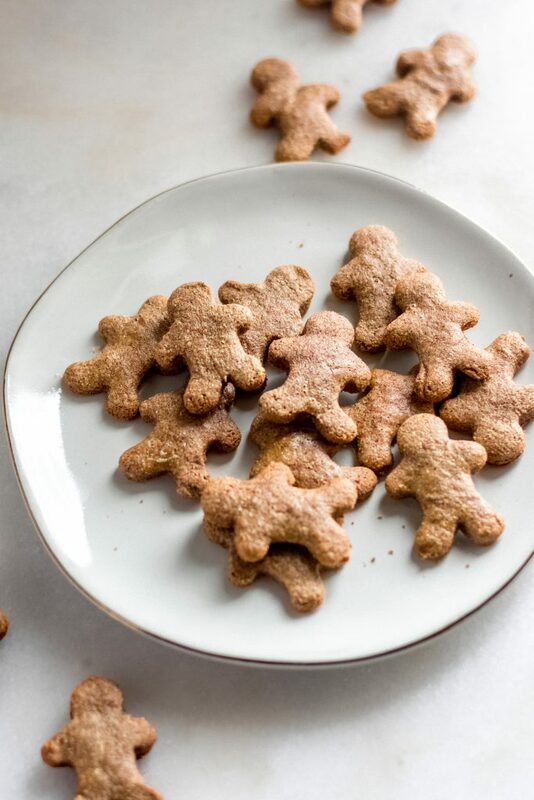 You’re thinking gingerbread cookies, but wait, you’re on the keto diet! 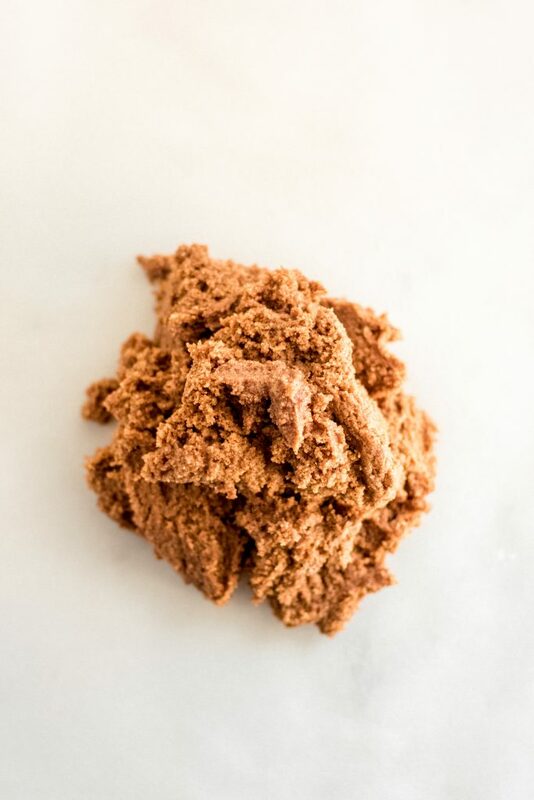 Worry not, here’s my Keto GingerBread Cookies recipe to get you the best of both worlds. I love dedicating an afternoon (or an entire day!) 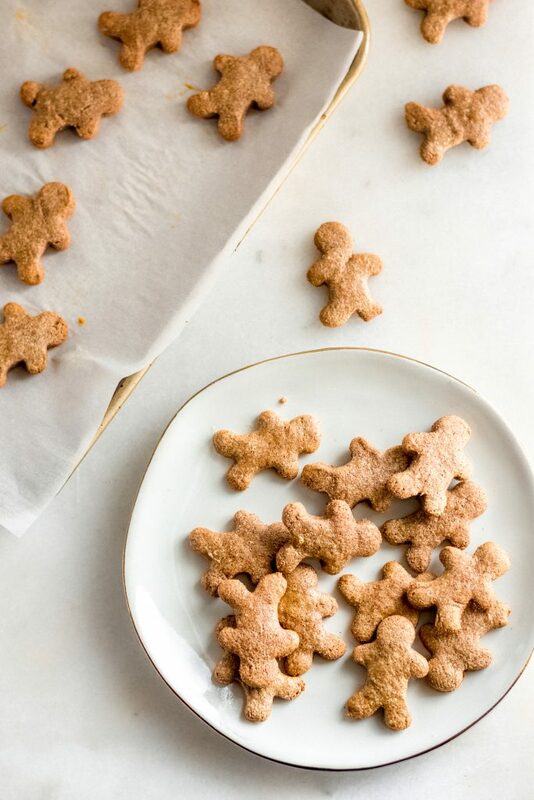 to creating fun and festive holiday cookies! There is just something so cozy and comforting about keeping up with this classic tradition! 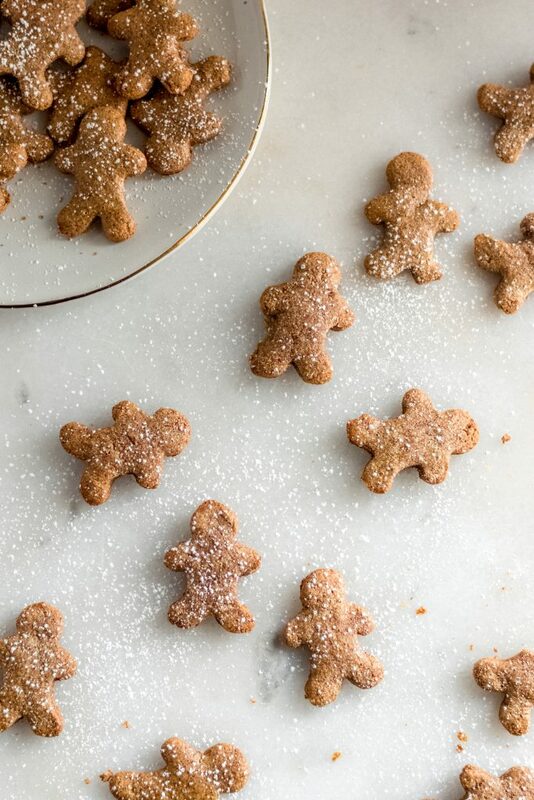 One of my favorite kinds of holiday desserts to make is gingerbread cookies! I love how fun and versatile they are and how they can be cut into virtually any shape. Their dough and texture makes them great for shaping and decorating, more so than many other types of cookies! Not to mention, they taste SOOO yummy. 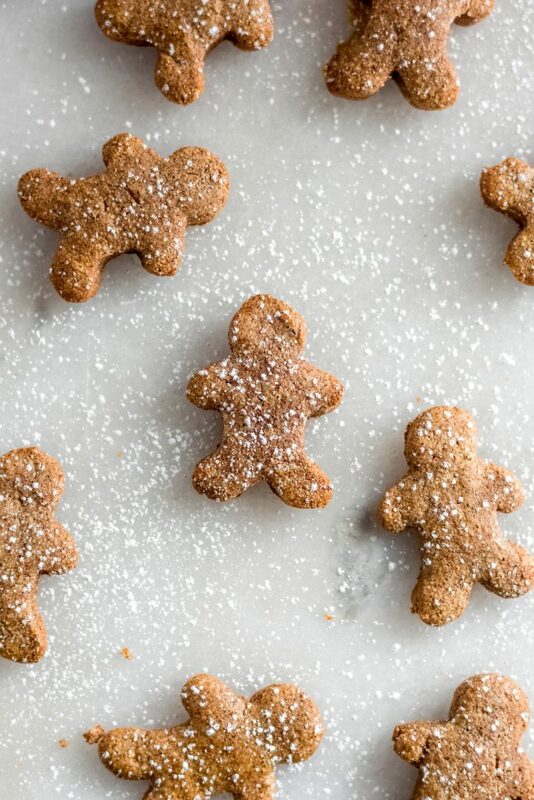 Did you know that gingerbread cookies date back as far as 2400 BC?! 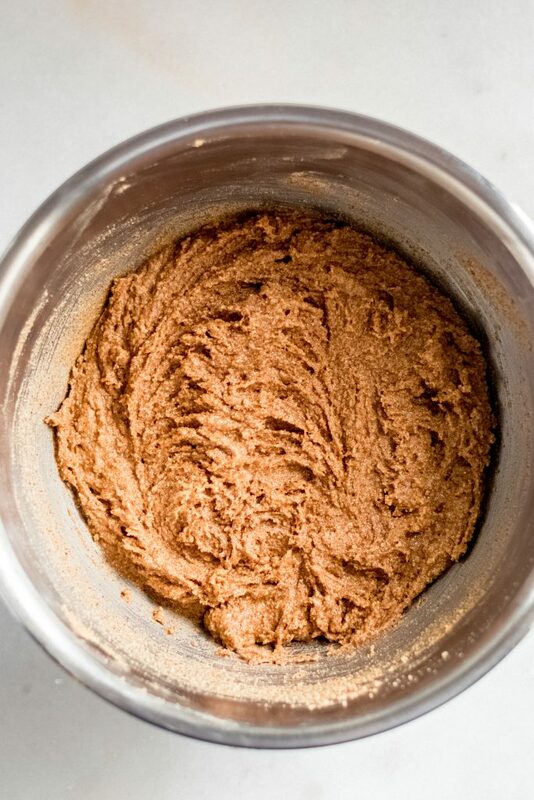 People have been enjoying the goodness that is gingerbread for AGES, and rightfully so! These cookies are amazing! It wasn’t until around the 15th century, though, that gingerbread cookies began to be baked similarly to how we prepare them today. 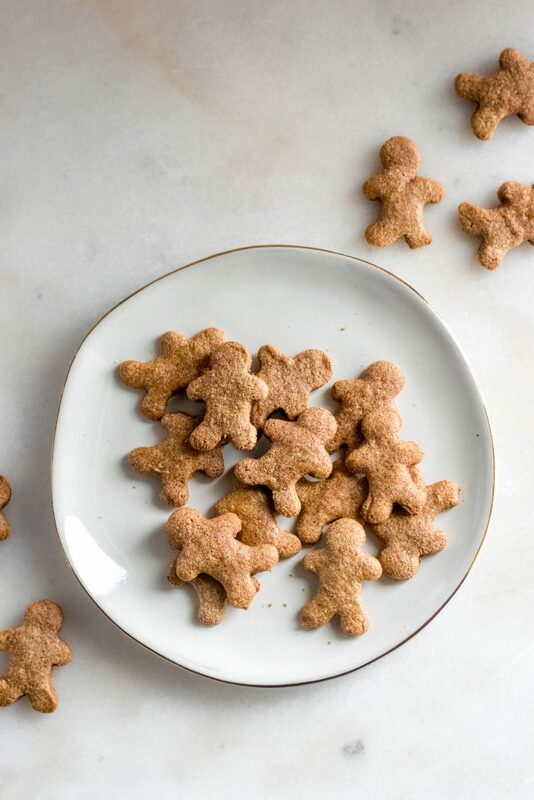 Interestingly enough, it was within that century that Queen Elizabeth I actually had gingerbread men created and began to decorate the gingerbread cookies the way in which we do today! 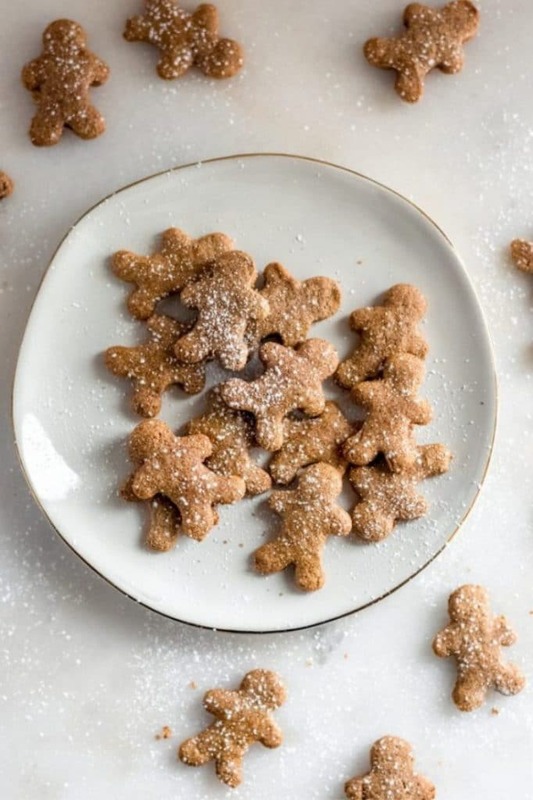 Yep, the intricate designs, patterns, and faces on the gingerbread men that we see everywhere during the holidays actually exist because Queen Elizabeth I got a little creative in the kitchen! Who knew she was the genius that kind of came up with this fun holiday tradition?! The PERFECT keto cookies for a low carb diet! During the holidays it can be pretty tricky to monitor carbs, especially when it comes to the cookies that we are so often surrounded with! Holiday parties and events are so much fun but DEFINITELY also present a lot of temptation! With these keto gingerbread cookies, you don’t have to worry about straying from your diet or lifestyle or going over your net-carb budget. These cookies are super low carb, with each serving only containing 3.8 grams of net carbs! These are perfect to bake up for holiday parties. 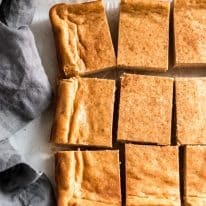 People will love them, AND you will be guaranteed to have a low carb sweet treat to munch on yourself! 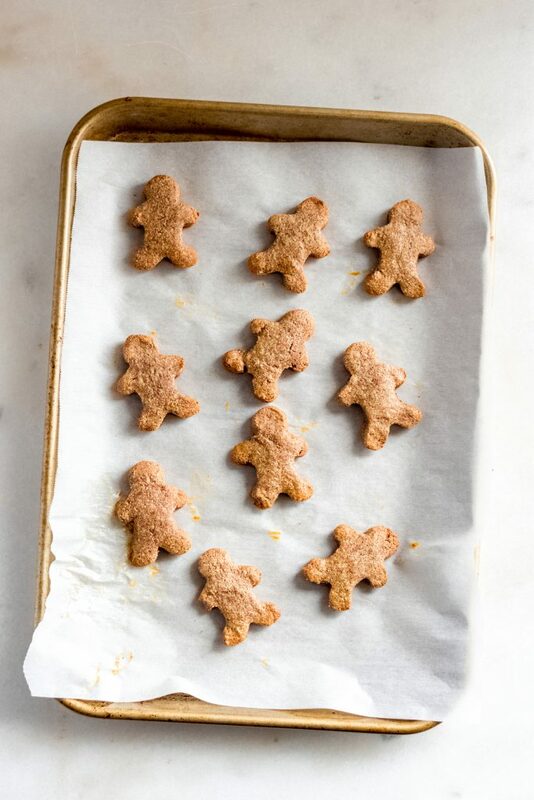 When making this recipe, I was able to keep these chewy gingerbread cookies low carb by cutting out the use of traditional, refined sugar, and instead using Lakanto Monk Fruit Sweetener. If you don’t already know, monk fruit sweetener is my every day go-to when it comes to baking sweets or anything that calls for sugar. It has ZERO grams of net carbs, is GMO free, and it doesn’t spike blood sugar! This stuff is SO delicious and tastes exactly the same as regular sugar! What is also so great about it is that it is so easy to introduce into your recipes. It substitutes for sugar with a 1:1 ratio, meaning you do not have to come up with new measurements to achieve the same level of sweetness! There are two versions of this granulated sweetener, Classic and Golden. The Classic version is great for substituting white sugar, and the Golden is a great alternative to brown sugar! Lakanto is a fantastic company and actually offers Real Balanced readers a deal that is prettttty sweet (pun very much intended ?)! If you are interested in trying out monk fruit sweetener, you can get a Taste Test Bundle for 60% off! It is seriously such a good deal, and I DEFINITELY recommend giving it a try, especially if you’re on a low carb diet. Click here to learn more and get 60% off on the Lakanto Taste Test Bundle! 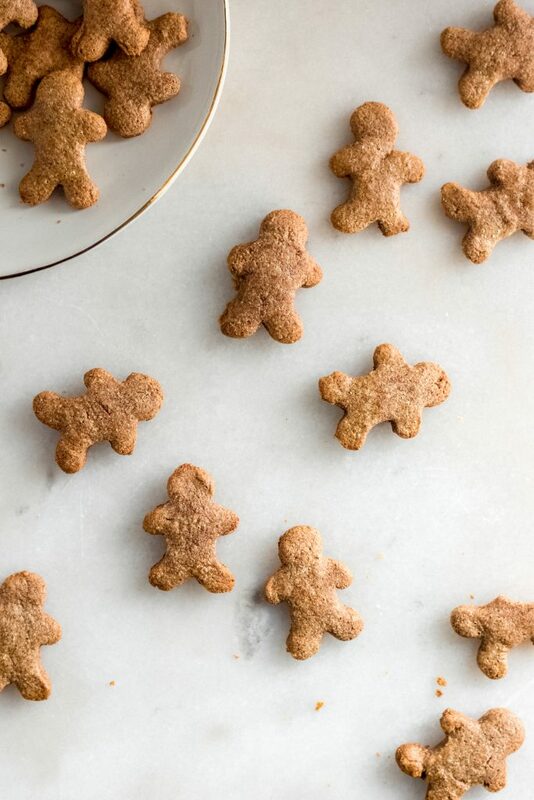 I absolutely LOVE these chewy gingerbread cookies, and how all of the ingredients and spices come together to create that rich, familiar gingerbread taste. Within this recipe is a whole bunch of goodies including SunButter, Lakanto Monk Fruit Sweetener, coconut flour, and heavy whipping cream. It also includes a variety of spices, such as cinnamon, nutmeg, ginger, allspice, cloves, and the star of the show, ginger! Did you know ginger actually has a TON of benefits? To start, it contains gingerol, which is a huge medicinal property, as it has anti-inflammatory and antioxidant features. Closely related to turmeric, this spice is great for treating nausea, muscle pain, blood sugar, and heart problems. Not only is it super tasty, but it’s also incredibly beneficial. How awesome is that?! These keto friendly cookies are seriously the BEST, and they are so easy to make too! 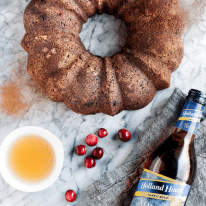 They take less than two hours to prepare from start to finish, including bake time, and the whole process is sure to become one of your new favorite holiday traditions. Check out how to make these keto friendly cookies! 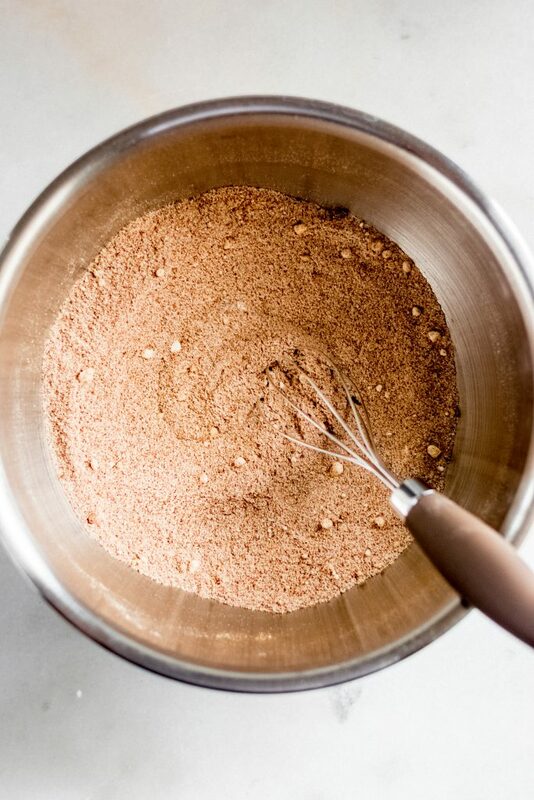 In a mixing bowl, whisk together coconut flour, monk fruit sweetener, cinnamon, ground nutmeg, ground ginger, cream of tartar, baking soda, salt, ground allspice, and ground cloves. Add eggs, SunButter, and heavy cream. 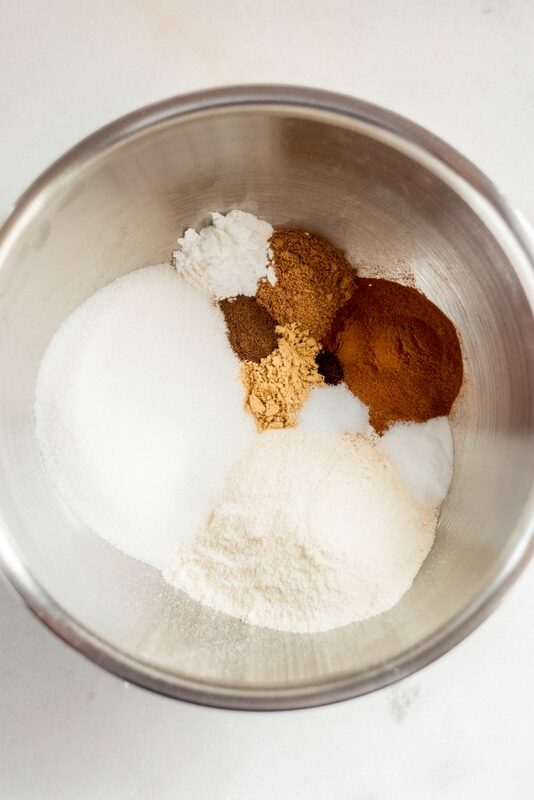 Mix with an electric mixer until well-combined. Cover bowl with plastic wrap, transfer to refrigerator, and chill for 1 hour. After dough has chilled, preheat oven to 300 degrees and line baking sheet with parchment paper. 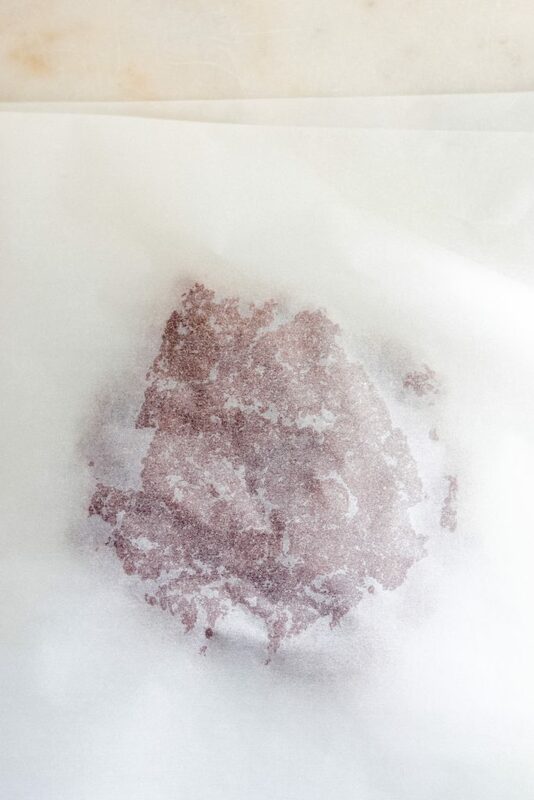 Spray two pieces of parchment paper with nonstick cooking spray. Lay one piece down, spray side up, placing chilled dough in center. Lay the other piece down, spray side down so it touches the dough, and lightly press down. Using a rolling pin, roll dough until it is an even layer, being careful to not roll dough too thin. Using cookie cutters, cut dough into desired cookie shape. 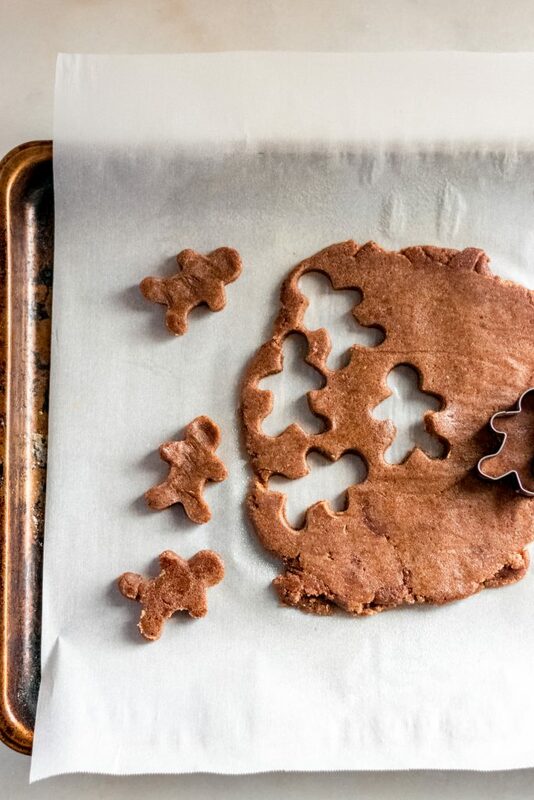 Transfer cut cookies to prepared baking sheet. 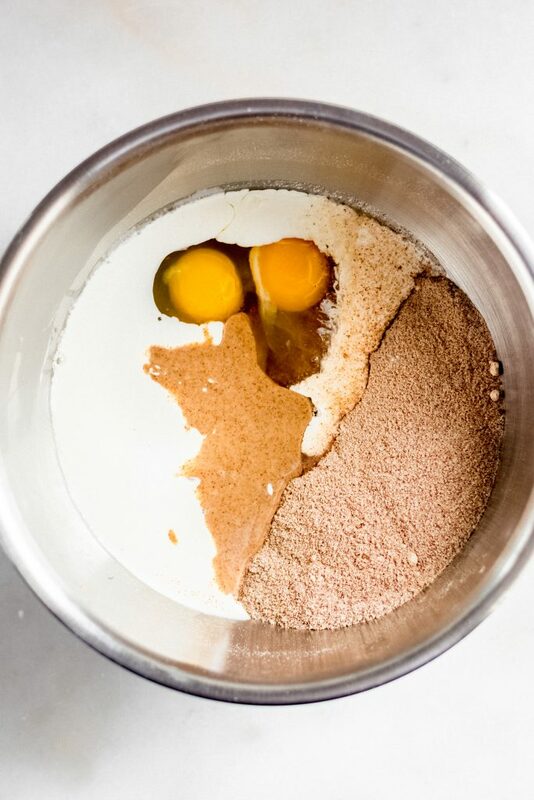 Whisk remaining egg in a small bowl, and using a pastry brush, brush cookies with egg wash. Then bake cookies until cooked throughout, about 30 minutes. 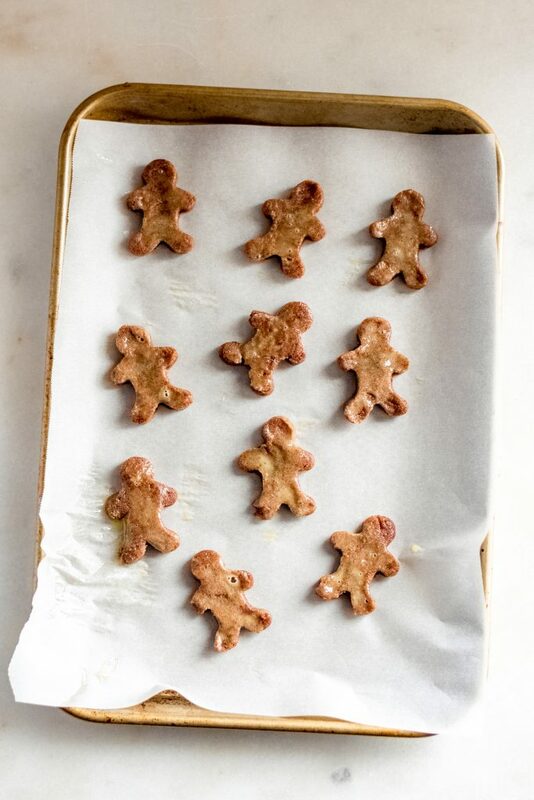 Wait for gingerbread cookies to cool before removing from baking sheet. Sprinkle some powdered monk fruit sweetener atop cookies, serve, and enjoy! 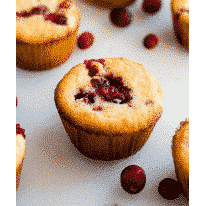 Whether you are keto or simply want to watch your sugar intake this holiday season, these cookies are a great option. 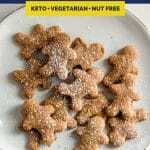 Keto and Low Carb: Perfect for keto-ers and low carb-ers, these delicious keto Christmas cookies only contain 3.8 grams of net carbs per serving. Primal: The ingredients in this recipe follow primal diet restrictions. Nut Free: Free of any nuts or nut products, these cookies are great for those with nut allergies and intolerances. Vegetarian: This recipe is vegetarian-friendly. Refined Sugar Free: Thanks to the use of monk fruit sweetener, these cookies are refined sugar free! Looking for more sweet treats from Real Balanced? When it comes to sweets treats and desserts, I have a TON of ideas and fun recipes for you to put into action! 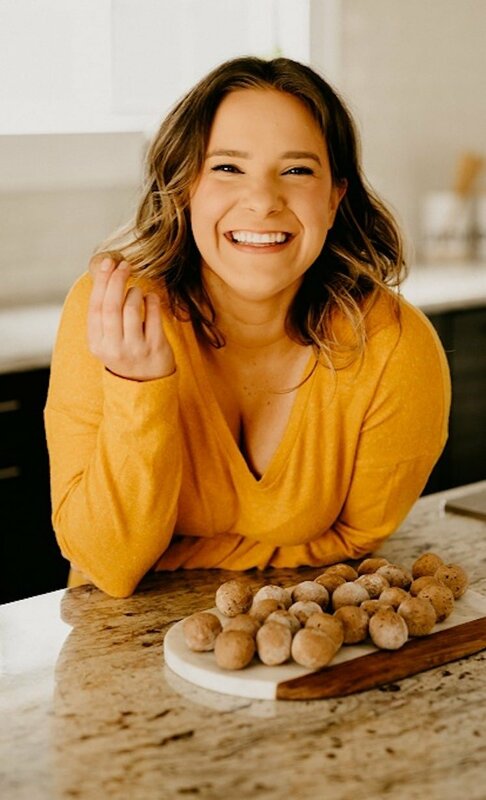 From Low Carb Chocolate Chip Cookies and Glazed Sugar Cookies to Peppermint Patty Fat Bombs (which are PERFECT for keto-ers! ), there is something for everyone to enjoy! Check out these ideas and let me know what you think! 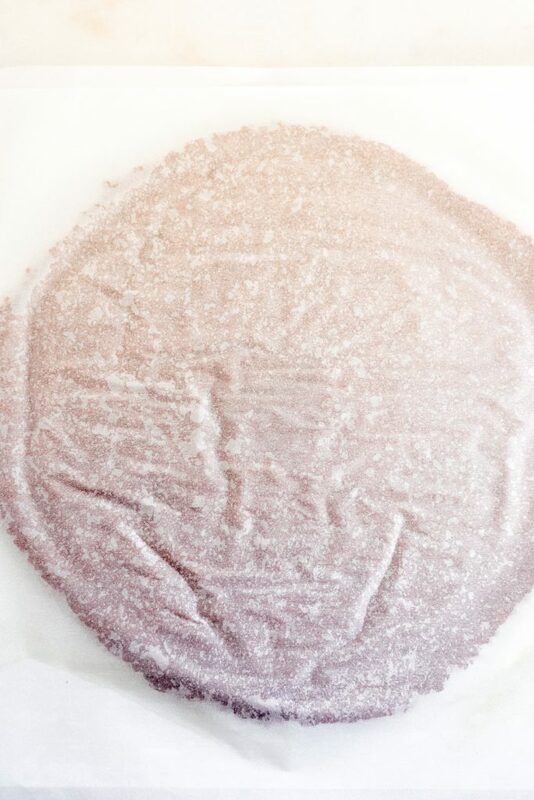 Curious about the SunButter – Soften it? Mine doesn’t seem to be hard or firm, so what do you mean? I also don’t keep it in the fridge. Thank you! Can’t wait to try these. Could you tell me what size is your cookie cutter? Hi, Michelle! I used the gingerbread-shaped cookie cutters from this pack, which are about 1-inch in length. I hope you enjoy!!! That’s the correct amount of cinnamon! Sorry that you thought it was too much!